The ThinkPad T-Series is apparently getting an update soon as the CES 2018 draws near – but one model of the 2017-lineup seems to be getting the axe. The T480p as the successor of the T470p could be made obsolete by the new 15 W Quad-Core CPUs. In the last years, Chinese manufacturer Lenovo always announced its newest ThinkPad laptops at the technology fair Consumer Electronics Show (CES). The CES takes place in Las Vegas every January. Reason enough to assume that the announcement of the newest ThinkPad T-Series models will happen soon. A recently released blog-post of a Polish Lenovo-partner confirms this assumption. According to digitmedia.pl, the new models ThinkPad T480, ThinkPad T580 and ThinkPad T480s will be announced at CES and they are going to be available in a March/April timeframe. Detailed specification about the successors of the T470, T470s and T570 were not included in this blog-post. However, the T-Series of the year 2017 didn't include three, but four models: The T470p was the Quad-Core variant of the T470 and the only T-Series ThinkPad with the powerful CPUs of the Intel Core HQ-Series. This model-line will be discontinued according to digitmedia.pl and the T470p will remain on sale for some time. At this point, we can only speculate why Lenovo decided to discontinue this model. A possible reason could be the performance-jump of the low-power U-Series CPUs, which will presumably power the other new T-Series laptops. The "Kaby-Lake-Refresh"-CPUs with four cores like the Core i5-8250U are indeed much faster compared to their Dual-Core predecessors. The T4xxp-series was originally introduced with the T440p in 2013. 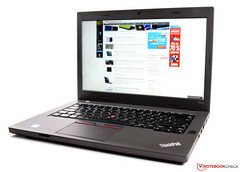 Its sister-model, the T440, was the first standard T-Series model with ULV-Series CPUs. This meant that the T440 was slower than its predecessor, the T430, as the T430 was powered by 35 W Dual-Core chips, which Intel no longer makes. The T440p as an additional option was likely meant to close this performance gap.